I’ve had the opportunity to watch the movie “War Room” for a second time, and I find myself, once again, deeply impacted by the important and powerful message the Kendrick brothers have delivered to a world in need. If you walk away from the movie with anything less than a desire to stand up and fight for the life God designed us to have, you have missed the heart of the story. We MUST have a plan! Without one, we will loose the fight…& the fight is not against man. We can hear the Word of God and gain knowledge, but until we actually treat it like a VERB (through obedience) we will not see the fruit we desire in our lives. 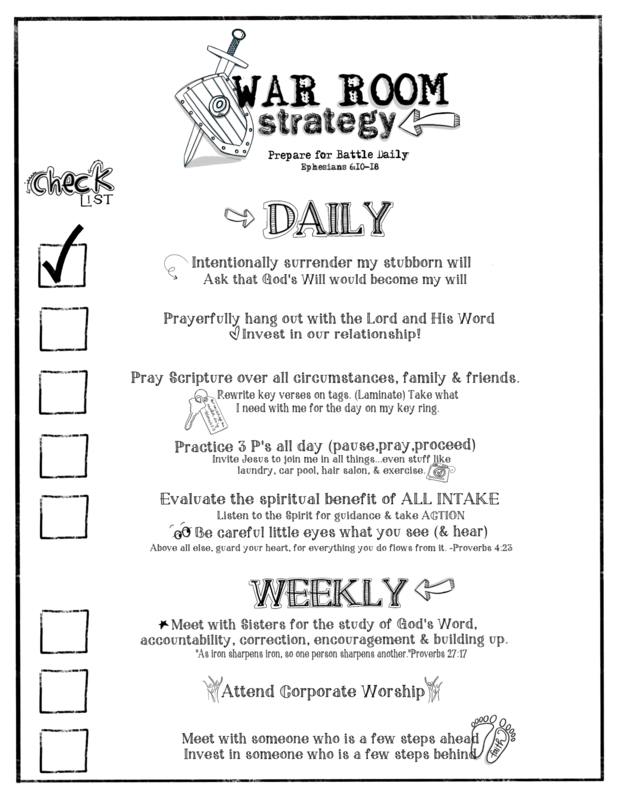 I pray that the “plan” outlined above, might be an encouragement to you. Don’t start your day without a strategy… your enemy has one. Get out your sword (which is the Word of God) and fight for LIFE. Elizabeth: I don’t have time to pray that much every day. Miss Clara: But you apparently have time to fight losing battles with your husband?